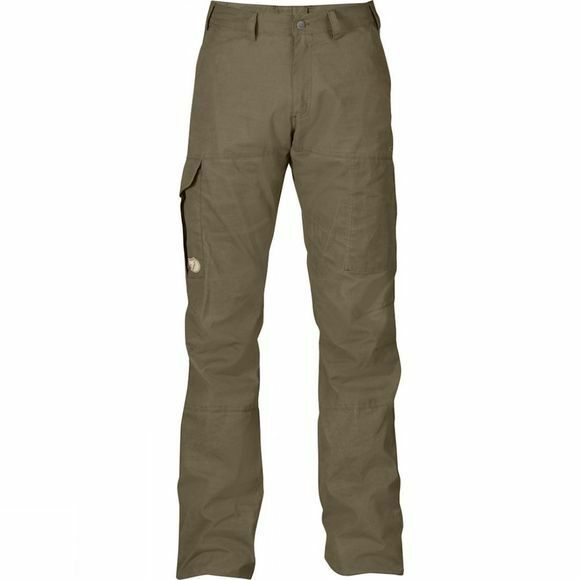 The Men's Karl Pro Trousers from Fjällräven are durable and versatile outdoor trousers that are just as suitable for mountain trekking as for forest hikes. Made from wind and water resistant G-1000 Silent that has a lightly brushed surface. The fit is regular with a mid waist. The cut sits well and allows excellent freedom of movement – even with its slightly narrower legs. The knees and rear are pre-shaped and the waist is slightly higher at the back to sit well when wearing a backpack. There are two leg pockets, one with a zip and one with buttons, the latter also has an inside mesh pocket for a mobile phone. There are two hand pockets and two back pockets with flaps. The hems are raw length and can easily be adjusted to fit any height perfectly.